Flexibility with simple and modern media return. Lib-Chip can provide and support Return- and Sorting Units. The library has many options when choosing the type of installation. The system is available with a minimum of 2 sorting bins, but can handle over 255 bins. Materials can be moved around corners, to different floors and sorted by numerous criteria. Extra staff induction can be integrated. Lib-Chip sorting modular design allows for easy and economical system expansion. Sorting systems start at a minimum of two or three bins and additional bins may be added in modules of two. Lib-Chip Return 2-way sorter unit allows for a quick and accurate check-in of material. This mini system is available with a bi-directional belt, separating items that need to be shelved, and item that have a special status (i.e. holds and/or transits). 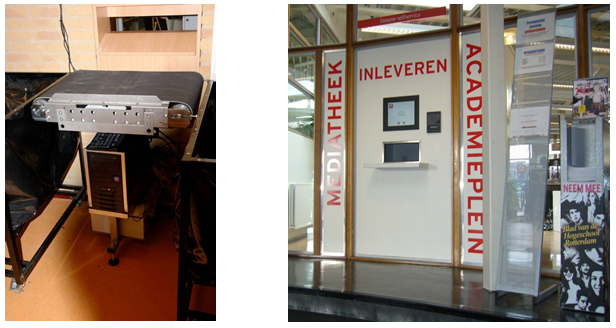 The unit is height adjustable, therefore the library is able to use their existing bins. Ofcourse Lib-Chip has custom bins available. Each library has specific requirements to best serve their patrons. Lib-Chip provides custom-built sorting solutions to address these detailed design conditions. We will work in conjunction with the library staff and design the configuration which will best utilize the workspace and fit the budget. Whether your library requires a simple 3-Way Sort or a 255-Bin Sort with multiple access points on different levels. 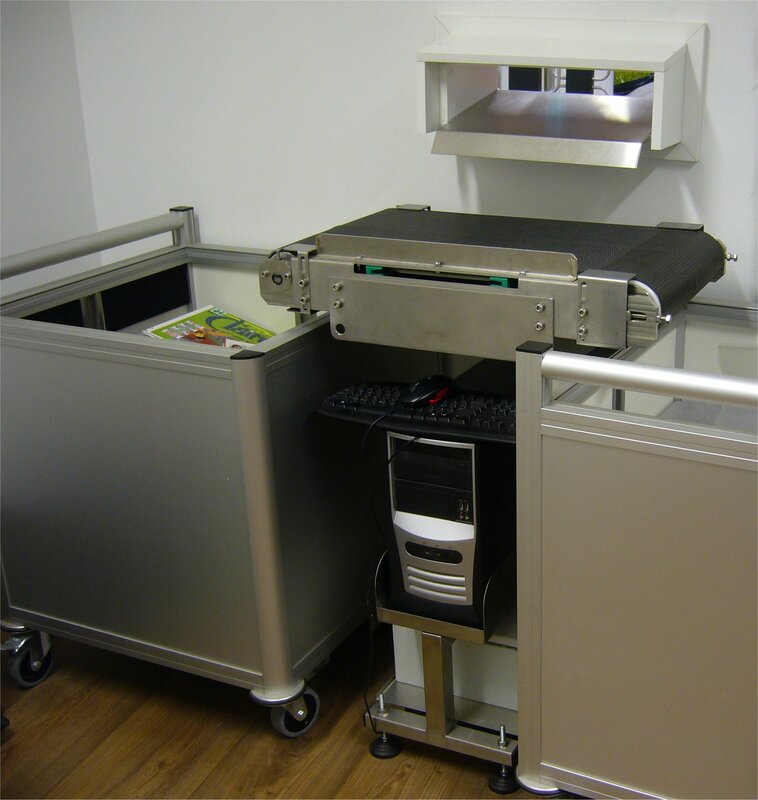 The Lib-Chip Modular Automatic Sorter is a modular system allowing libraries to construct virtually any sorting solution. The roller top belt with ball transfer system offers the highest grade off flexibility regarding conveyor options and at the same time different flow directions combined in only one conveyor. With cylindrical rollers and/or paddles it is not possible to combine products flow directions. Paddles apply a sideway force on items that may be damaging fragile items, such as books with a flexible spine and/or synthetic cd/dvd boxes. Also their is always a possibility that material get stuck between a paddle and the conveyor belt. This is why very thin items must be sent to “another BIN” or the end BIN. Result is a manual re-sorting by staff. Elevating rolls do need to go up for a lateral movement. This means that there is always an opening between the (two) rollers. Because off the opening, small material can tilt simply and can get stuck between the rollers. The same for library material that is curved or does have a bookmark ribbon that hanging out the book can get and/or entangled between the rollers. Multiple languages, easily customized by library staff. Please contact a Lib-Chip sales professional to discuss your needs and discover why Lib-Chip is your best choice as a technology partner.